Why would I need self storage in Tucson, AZ? There are a variety of reasons why you might need self-storage in Tucson, AZ. How much is a storage unit in Tucson, AZ? The cheapest storage unit in Tucson, AZ is $38.00 per month. What size storage units do you have available in Tucson, AZ? In Tucson, AZ we have sizes that range from 5'x5' to 10'x30' to suit your storage needs. How much is it for a 5'x5' storage unit in Tucson, AZ? The cheapest 5'x5' storage unit in Tucson, AZ is $55.00 per month. 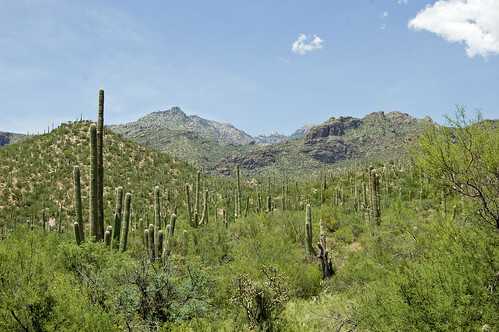 Tucson is located in Southern Arizona and surrounded by five large mountain ranges. The area receives an average of 350 days of sunshine each year and is considered part of the Arizona Sun Corridor. Thanks to its temperate climate, cultural diversity and diverse economy, Tucson has experienced consistent population growth since the early 1900s. Biking is one of the area's most popular activities, with over 800 miles of bike paths and an annual biking event called El Tour de Tucson. The city is also well-known for its Sonoran-style Mexican cuisine. One of its iconic dishes is the Sonoran hot dog, a hot dog wrapped in bacon and topped with beans, tomatoes, jalapeño peppers and other garnishes. Tucson has been home to different cultures and groups for about 12,000 years, and archaeologists have discovered agricultural settlements in the area dating back as early as 2100 B.C. Originally a Native American village, the area was settled by non-indigenous people in 1775 when Hugo O'Conor formed the Tucson Presidio. During the mid--1850s, the territory that is now Arizona was acquired by the United States, and Tucson was eventually declared the capital. After several years as a wild Western town, the city eventually evolved into a popular destination for young professionals, families and college students. Thanks to its rich history, Tucson has a diverse culture with Spanish, Mexican, Native American and European influences. The unemployment rate in Tucson is lower than the national average, and there are a variety of jobs available in the city and surrounding areas. A significant portion of the city's economic development stems from the University of Arizona, as well as Davis-Monthan Air Force Base. One of the leading industries in Tucson is technology, with the high concentration of optics manufacturers earning the city the nickname "Optics Valley." A few of the large employers in Tucson include Texas Instruments, Raytheon Missile Systems, IBM and Honeywell Aerospace. You'll also find the tourism and education sectors to be significant sources of job opportunities. This diverse neighborhood is named for one of Tucson's early civic leaders, and is located very near the University of Arizona. The entire Sam Hughes area has earned designation as a National Historic District, and you can explore the neighborhood's oldest homes during the annual home tour. Barrio Historico is one of the oldest neighborhoods in Tucson, and its rich Hispanic roots provide it with a lively sense of culture. Today, many artists have moved into the area, with the brightly-colored adobe row houses serving as a recognizable signature of the neighborhood. The Catalina Foothills neighborhood is at the base of the scenic Santa Catalina Mountains, and great care has been taken to preserve its natural beauty. This area has a large number of saguaro cacti, one of the most iconic plants in Arizona. Nicknamed the Beverly Hills of Tucson for its California-inspired style, El Encanto is dotted with towering palm trees and lush green lawns. All the streets in this neighborhood were named during a local contest, in which residents entered their ideas for streets with Spanish names. The Tucson metropolitan area is home to several school districts in and around Tucson, including the Tucson Unified School District, Vail School District, Griffin Foundation and Sunnyside Unified School District. You can also explore public and private school options, many of which offer a specialized curriculum. The largest post-secondary institutions in Tucson is the University of Arizona. There are many other small and large schools to choose from in the area, including Pima Community College and a campus of Arizona State University that focuses on providing degrees in social work. Utilities: The City of Tucson and Metro Water provide water and the Tucson Electric Power Company is the main electricity provider in the area. Garbage and Recycling: The city administers regular curbside collection of trash and recyclables. Transportation: The Sun Tran transit system provides a variety of public transportation options in the Greater Tucson area, including bus, shuttle and streetcar services. The median home price in Tucson is slightly lower than the national average, as is the overall cost of living. The neighborhoods of Tucson offer a variety of housing options, including single-family homes and multi-family communities, so you'll be able to find something that fits your needs and budget. Our lowest priced units in Tucson, AZ average $63.71 per month. 445 people have reserved units in Tucson, AZ in the past 30 days. There are 7 locations within Tucson, AZ's city limits. There are 5 locations in Tucson, AZ that offer AC and Heating features.